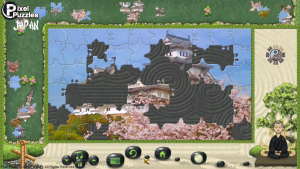 Pixel Puzzles Japan is a 2014 jigsaw puzzle solving game from Decaying Logic that I recently got in a bundle. I like having a supply of quick casual games I can play when I need a short break or have just a little time to play something so I definitely thought it was worth getting (even though I actually bought the bundle for a different game that I will review pretty soon). However, I never expected to get as addicted to it as I did. While the game isn’t perfect and obviously has a very niche market (most video gamers aren’t really the jigsaw puzzle solving type), I think it is definitely worth purchasing and playing if you enjoy jigsaw puzzles. Pixel Puzzles Japan does offer some things a normal non-digital jigsaw puzzle can’t offer. First of all, the game utilizes a sort of “fishing” mechanic to retrieve the puzzle pieces. They move around the top and left sections of the screen and you have to “fish up” the piece you want. It’s a novel way to show all of the unused pieces without struggling to fit them all on the screen but my thoughts on this mechanic are mixed. At first (for the easier, smaller puzzles), the fishing mechanic is kind of fun and makes a lot of sense. However, once you start getting into the jigsaw puzzles with more pieces it quickly gets annoying and frustrating. This is because it becomes almost impossible to grab the pieces you want since they group up together and the game tends to give you a random piece near where you click (instead of just the piece you actually clicked on). The other major thing Pixel Puzzles Japan does that normal jigsaw puzzles can’t is the strange and creative ways the game cut the puzzles. The game cuts some of the puzzles in ways a real jigsaw puzzle never could. For example, some of them are extremely jagged or are cut so sharp you would probably cut yourself if they were physical puzzles. The way the puzzles are cut leads to some interesting and unique puzzles to solve. In a few cases, they actually made the puzzle easier for me to solve but in most cases, it really increases the difficulty. That’s a very good thing since jigsaw puzzles are usually pretty easy to solve (as long as you solve the outside first and then work your way in) and I welcome any added difficulty to them. © Decaying Logic An example of one of the strange puzzle cuts the game uses (though some of them are even much more unusual than this one). 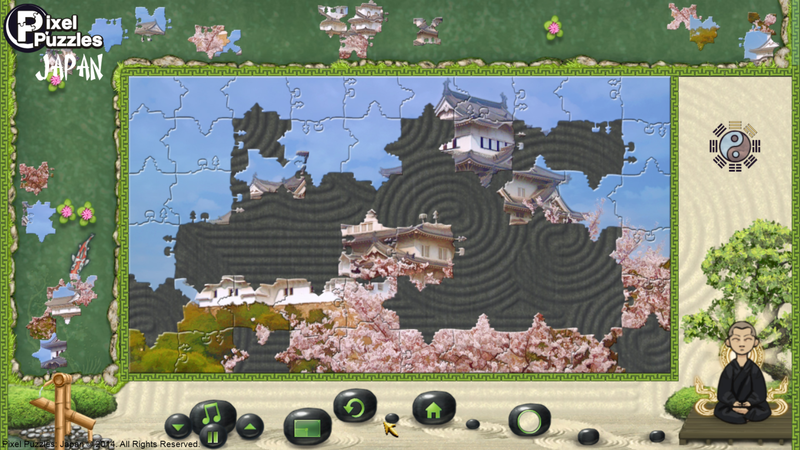 Other than that, playing Pixel Puzzles Japan is basically just like putting a normal jigsaw puzzle together. The game scores pretty high in bang for your buck, offering 21 puzzles (the game shipped with 19 and added two free DLC puzzles later) for a retail price of $6.99 (and the game has been in bundles and on sale a few times already). You can’t even get one high quality normal jigsaw puzzle for that price. There are six 60-piece puzzles (very quick and easy to solve), five 112-piece puzzles (still pretty easy), four 153-piece puzzles (getting quite a bit tougher), three 220-piece ones (these can take 30 minutes to an hour to solve), and one massive 350-piece puzzle (which took me over an hour to solve). All in all, the game took me about nine hours to complete all of the puzzles. Unfortunately, one big negative Pixel Puzzles Japan has is the lack of a save progress feature. While this isn’t a big deal for the first two sets of puzzles (since you can easily solve them in 15 minutes or less), once you start getting into the tougher, more time-consuming puzzles this could quickly become a huge nuisance. 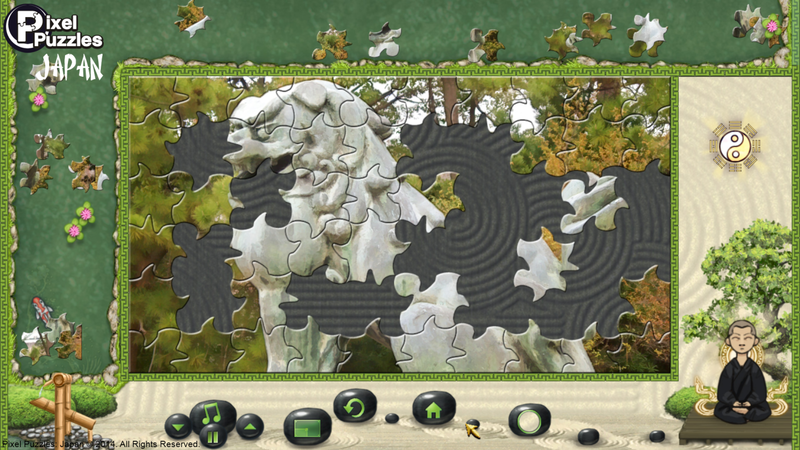 If you are halfway through the puzzle and need to quit for any reason, you will either have to lose your progress on that puzzle or leave it open on your computer until you are ready to finish it. I doubt this feature would have taken long to code and it is definitely one that should have been included. The only other thing I feel is a negative about Pixel Puzzles Japan is that in the larger puzzles, the pieces get really small and are pretty hard to see. It’s especially hard to see them when you are trying to fish them out. While this was just a small annoyance for me, I’m still pretty young and I could definitely see older people (who are conveniently the people most likely to play a jigsaw puzzle game like this) having some trouble with this. I wish the game would have included some sort of zoom feature to help combat this problem. Other than those two negatives, I have nothing bad to say about the game. The puzzle art is fine as long as you are into Japanese locations and architecture. The music is a little repetitive but extremely relaxing to the point of even making me a little sleepy. If you aren’t exactly into the Japanese theme of this game, Decaying Logic has also released a very bloody zombie-themed jigsaw puzzle game called Pixel Puzzles: UndeadZ (my review will be coming soon). They also just released Pixel Puzzles 2: Birds earlier this month which actually has an autosave feature (thank goodness). I definitely enjoyed Pixel Puzzles Japan and recommend it for all jigsaw puzzle fans (even for full retail price). While the lack of some sort of zoom and save progress feature is disappointing, the game’s positives more than make up for it. Non-jigsaw puzzle fans might still enjoy the game but I would probably wait for one of the games to be bundled or put on sale to give it a try (so you aren’t out much if you don’t enjoy it).